The UK’s Co-Op Insurance wants you to be able to park your car without it getting stolen. The best way to accomplish that is to make an informed decision about where is safe. 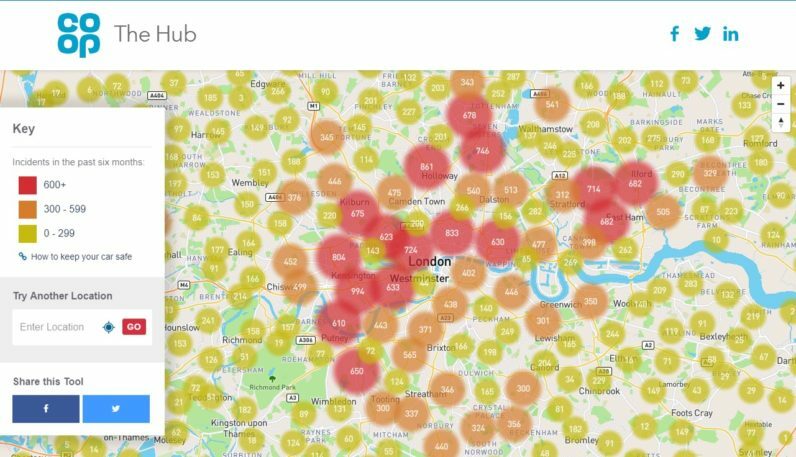 With that in mind, it’s released a new web-based tool called Park Smart, which uses open data published by the Home Office, in order to show you car-crime hotspots. The data covers England, Northern Ireland, and Wales, the period from November 2016 to April 2017, and is regularly updated. Unfortunately, there’s no data for Scotland. As you might expect, large cities experience more car crime than small towns and villages. The data also shows that the most affluent parts of the country, like Kensington and Mayfair in London, see more car crimes than poorer areas, like Moss Side in Manchester and Toxteth in Liverpool. That’s hardly surprising though. I imagine all the cars worth stealing in the UK are parked outside of Harrods, and London’s other extravagant boutiques. It’s a pretty handy tool, and when you’re looking for your next parking spot, it’s totally worth consulting. Check it out here.